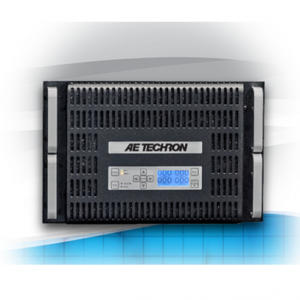 AE Techron’s 7700-Series amplifiers offer great power and flexibility. The series consists of three models; each model can be used as a free-standing gain block or combined in multiples to achieve high voltage (300 V RMS at 50 A RMS) or high current (up to 340A at 13.5 VDC continuously). 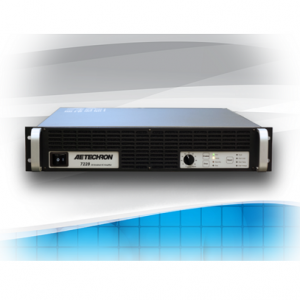 AE Techron’s 7220-Series amplifiers, when used with a signal generator such as the AE Techron 3110, can simultaneously produce both the DC voltage needed to drive the DUT and the high-frequency (AC ripple) conducted interference waveform required in cranking tests found in Standards like FMC1278, (CI210, CI230, CI250, CI260). They can also be used to perform surge and droupout tests found in many automotive Standards, like GMW3172-07, ISO 7637-2, and SAE J1113/2. 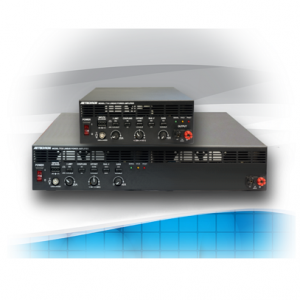 When used with AE Techron’s T-Series coupling transformers (T1000, T2000 and T3700), 7220-Series amplifiers are ideal for use in the low-voltage conducted or radiated immunity tests needed for Aviation industry Standards like DO 160 (Section 18 and 19), MIL STD 461/462 (CS101 and RS101), Airbus and Boeing audio bandwidth electrical and magnetic tests. The 7220-Series amps are a perfect choice to drive small to medium Helmholtz coils and radiators like those specified in FMC1278 (RI140, RI150). The 3110 is a simple-to-use yet powerful standards waveform generator. 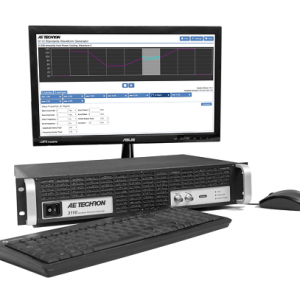 It can be combined with other AE Techron products to quickly create a wide range of powerful and intelligent EMC test solutions. The 3110 comes with an extensive library of tests for many automotive and industry Standards. Tests can be modified and saved for future use in the 3110’s library, which has the space to store more than 300,000 tests total. The 3110 produces standard signals and waveforms with or without a DC offset. Frequency, amplitude and DC offset can be fixed or swept, and sweeps can be linear, logarithmic or exponential. * It can create dropouts and surges with rise and fall times under 1 µs. Individual signal duration can be as short as 50 µs or as long as 49 days. It can also produce ripple waveforms of up to 300 kHz. The 3110 offers unique and powerful controls that make it easy to build complex tests containing repeating waveforms with up to four variables concurrently changing. Tests with non-linear or equation-driven frequency/ voltage/duration increments also can be created automatically using the csv import function. In addition, tests can be imported from the 3110 library and linked to form multi-test programs that can also be set to repeat, loop or wait for a trigger. The T1000 Magnetic-Field Susceptibility Transformer was designed to exceed the AF Magnetic Field susceptibility test requirements of DO 160 Section 19 and Boeing D6-16050 Section 7.2. It may also be used as a 10-to-1 step-down transformer for output current of up to 100ARMS. The T1000 transformer provides up to 300A-m and is able to generate up to 100ARMS. The turns ratio provides a ten-to-one step down to the secondary winding. The AE Techron Model T1000 provides convenient input connectors via binding posts. Standard 0.75-inch spacing of binding posts allows use of standard plugs. Output is via Multi Contact 125A plugs. 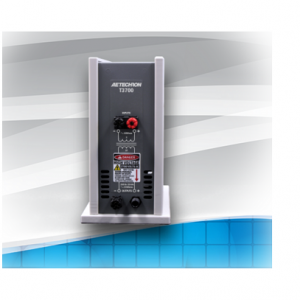 A 12-amp circuit breaker protects the unit against over-current conditions. A rugged, impact-resistant case and robust design protects the transformer from accidental damage. 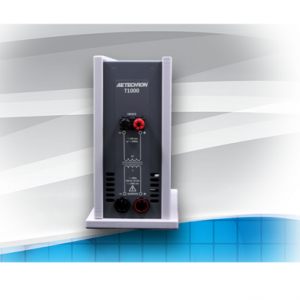 The AE Techron T 3700 provides convenient input connectors via touch-proof, four-way binding posts. Standard 0.75-inch spacing of binding posts allows use of standard plugs. 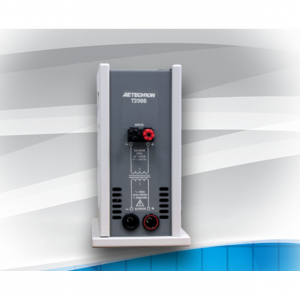 The T 3700’s voltage output meets or exceeds the requirements of DO 160 Section 19 and Boeing D6-16050-5 Section 7.2. It is for use by experienced staff.